This was hands down probably the hardest race/ run I have ever done in my life – still debating between this and the trauma that was Tower of Terror 2012. Tower of Terror was about 80+ degrees and 1000% humidity. This race was 28 degrees, with a 1000mph 28mph wind. See that little exclamation point icon? That was a severe high wind warning. Awesome. So back to what the heck I was doing at this race to begin with since I hadn’t actually ever mentioned that I was doing it. 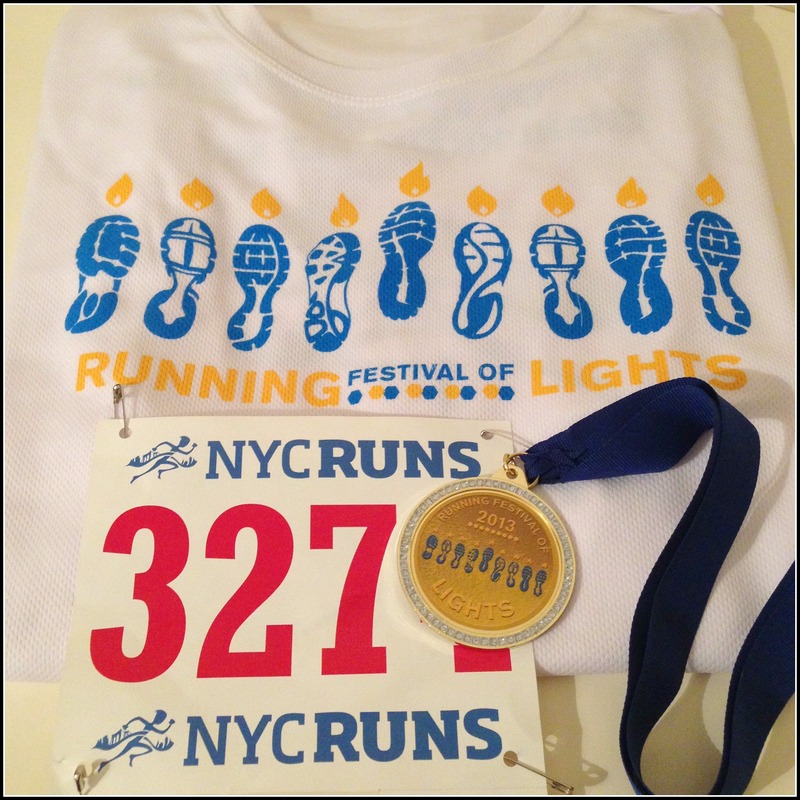 A few weeks ago I saw this event being put on by NYC Runs – The Running Festival of Lights which would include the Chanukkah Gelt 5k, the Oy Vey 10k and the Chanukkah Chalf. I totally got a kick out of it and when I realized I had a 16 mile run on the agenda for my Dopey training I thought it would be fun to do 13 of those miles with other people, in a new area and with water stops…for only $35, why not! Well come race day arctic temperatures had moved in and I seriously debated just skipping the race (if I wasn’t meeting a friend there there’s a good chance I would have!). But I piled on some layers, packed a bag with more layers and a change of clothes and jumped in my car to head to Brooklyn. I met my friend Alex at the starting area which was under a little bridge by a pier in Brooklyn and we huddled together and debated if we should add layers to what we were wearing. Alex & I trying to stay warm before the race! 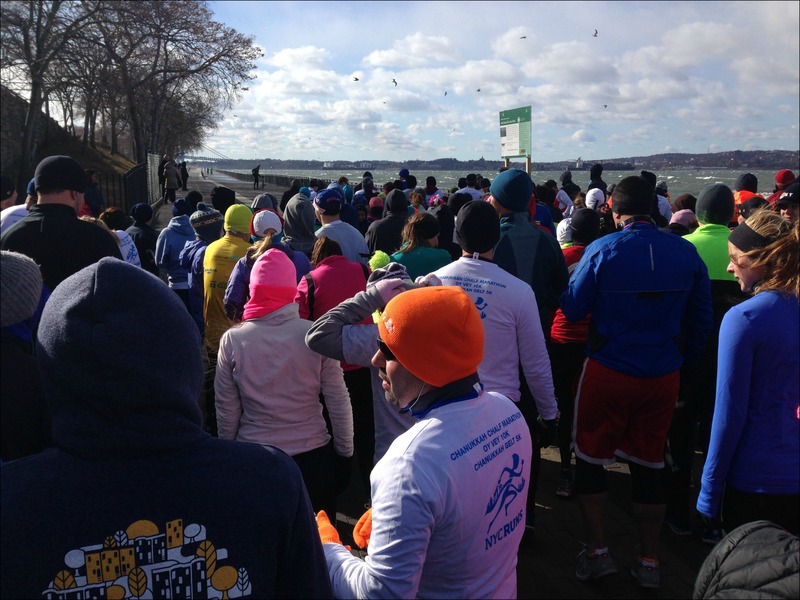 The nice thing about this race is that it was SO small (it ended up being about 250 people – I think a lot didn’t show up), that everything was located right under that little bridge – bag check, porta-potties (which I hear almost blew away!) and hot chocolate, and the starting line was just right outside the bridge, so we were able to hold onto our stuff to stay warm until about 30 seconds before the start. …I ended up not having to worry about that, I kept it on the entire time. Hood up, zipped all the way, just like this. Not my greatest look, but man did that jacket save me. …oh, and in case you haven’t already made this assumption, pier = by the water. 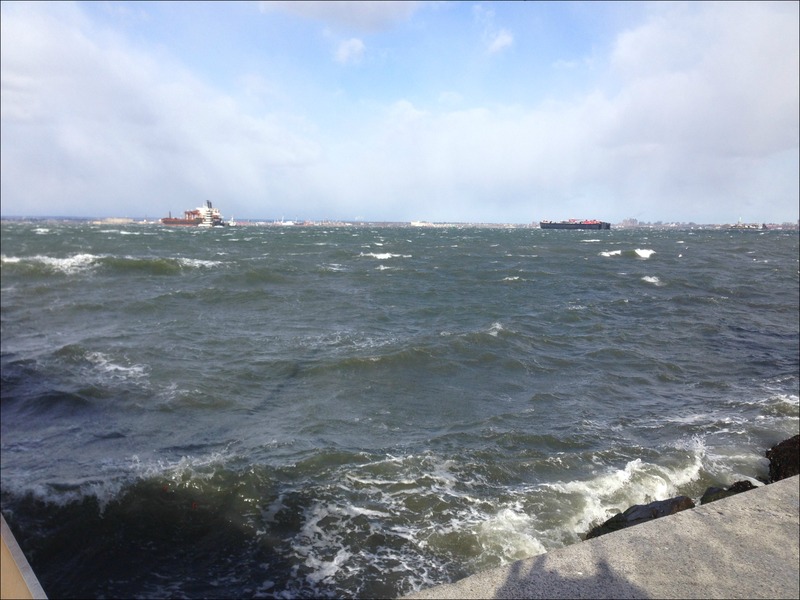 …and within the first few miles I realized there was a bigger problem than just the wind being worse by the water. The wind was SO strong that every once in awhile a wave would be so big that it would crash up against the wall and send icy sea spray all over the path we were running which not only meant you needed to watch out for icy spots, but if you had the misfortune of being in the wrong place at the wrong time you’d end up wet. But hey, there were great views of the city and the Statue of Liberty so that was nice…right?!? So, a quick recap of my race. I’m breaking it down into mileage segments since that’s pretty much how the race broke down for me (and apologies for not having any pictures but I couldn’t feel my hands so there was no way pictures were happening). I also don’t normally include my split times in a recap, but in this situation it helps to tell the story – you can easily tell when I was running with the wind or against it. This was the first “out” portion. The wind was at our backs so the running felt fairly easy and it was nice to be moving finally! It took the first few miles for me to even be able to feel my fingers and toes again, but with the help of the wind I was comfortably cruising along at a faster than “normal” pace. I grabbed a cup of water at the water stop and there was a layer of ice on the top. We made a u-turn and headed back now running directly into the wind. This was the first taste of how hard this really was going to be. My pace dropped quickly, I immediately got very cold again and the effort I needed to put in just to move in a forward direction was unbelievable. I was still pretty happy with my pace though and averaged out between running “with” the wind and running “against” the wind I still had a chance at a PR. Ahhh, back to running with the wind at our backs! I started moving along fairly quickly again and at times the wind was pushing me so hard from behind that I felt like my legs couldn’t move fast enough to keep up and I was going to get knocked over! The wind was definitely stronger than it was on our first “out” portion and I was trying to find a balance between running fast enough to keep on pace to PR, but at the same time I knew I needed to save enough energy to battle the wind on the way back. I don’t normally buy into the “time in the bank” idea, but in this case I needed to bank some time when the wind was with me. …I high-fived the volunteer at the turn around point and was excited to have just over a 5k left between me and a new half marathon PR! And then I hit a wall. Not the figurative marathon type of “wall”, but what felt like an actual wall. When I made the u-turn the wind literally stopped me in my tracks. It was so forceful that no matter how much effort I put in I was barely moving. I was literally running forward just to keep from being pushed backwards. I fought it for about a mile, but at mile 11 I gave up. The best way I’ve come up with to describe what it felt like is that it felt like I was pushing one of those weighted sleds that you see football players practice with. I’d give it everything I had and only move a little bit. 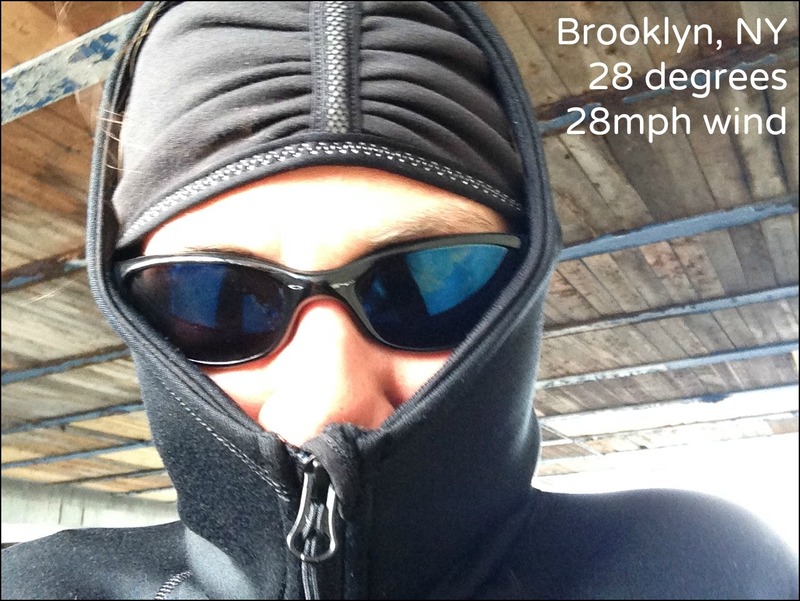 Plus, on top of that the cold wind going right down my throat as I was trying to breathe felt like it was suffocating me and the wind had really picked up so I was constantly getting hit with sea spray – luckily that outer layer and hood kept me relatively dry! Miles 11 & 12 involved a lot of walking mostly because it just wasn’t worth the effort to run, but also because I was having a lot of trouble breathing. I gave up on a PR. It just wasn’t worth it. With about half a mile left I saw the finish and realized if I ran hard I may still be able to finish in under 2 hours (my PR is 1:59:05, also my only sub-2 half) and the harder I ran the sooner this whole thing would be over with. I crossed the finish line in 1:59:50. Only my second sub-2 hour half and given the conditions, a time I’m actually very happy with. At the finish line volunteers quickly wrapped everyone in space blankets, gave out medals and directed everyone back under the bridge where there was hot chocolate and bagels waiting (although managing hot chocolate and a bagel when you can’t feel your hands was a challenge). I waited for Alex to finish and we went to my car to warm up. We changed in the car and literally sat there for 20 minutes before going anywhere just to thaw out. This race was hands down one of the hardest things I have ever done. I was so completely physically drained when I got home I didn’t move off the couch for the rest of the night and I got in bed at 9:30pm. However, showing up to the starting line and finishing this run was a true test of character and determination which is exactly what you need to finish something as crazy as the Dopey Challenge. Congratulations to everyone who left the warmth of their house yesterday and got out there and braved the weather for a run no matter how long or short. I’m sure you are a stronger person because of it. And as for the Chanukkah Chalf? I actually really liked the race itself! A good flat course with views of NYC and the Statue of Liberty and hot chocolate, bagels and schmear at the finish? Count me in for next year, let’s just hope next time it really is the Running Festival of Lights instead of the Running Festival of Wind! Back home and all thawed out! Congrats again on being such a rockstar and running this race! Thanks Abby, it was a tough one, but a good experience! Thanks! I have to admit I am pretty impressed too, but I have to give a lot of credit to the wind for some of those super fast miles! And yes, getting through something like this just makes us tougher as runners! 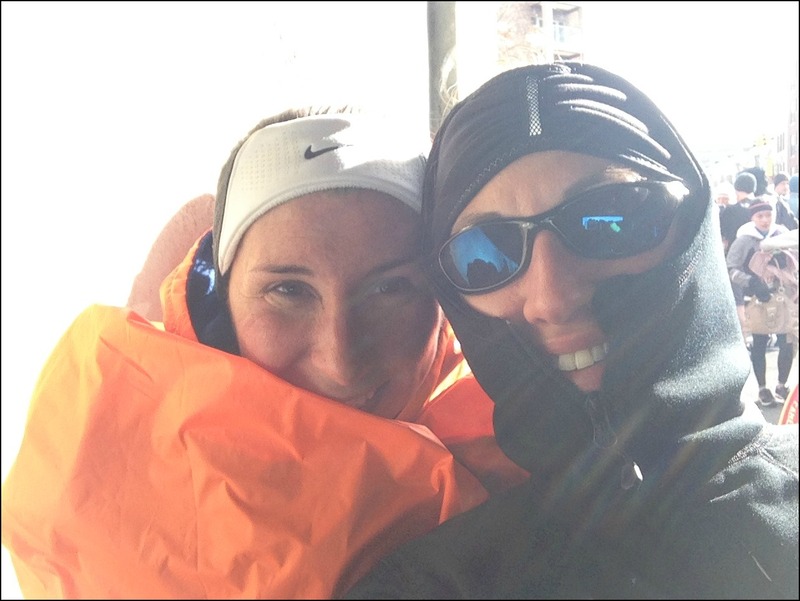 Fingers crossed that was the coldest/ hardest run we experience ever! Yowza! Something was in the forecast for a lot of this country. It was freezing here in Texas too. You get a ton of points for doing this one. Thanks Lesley. 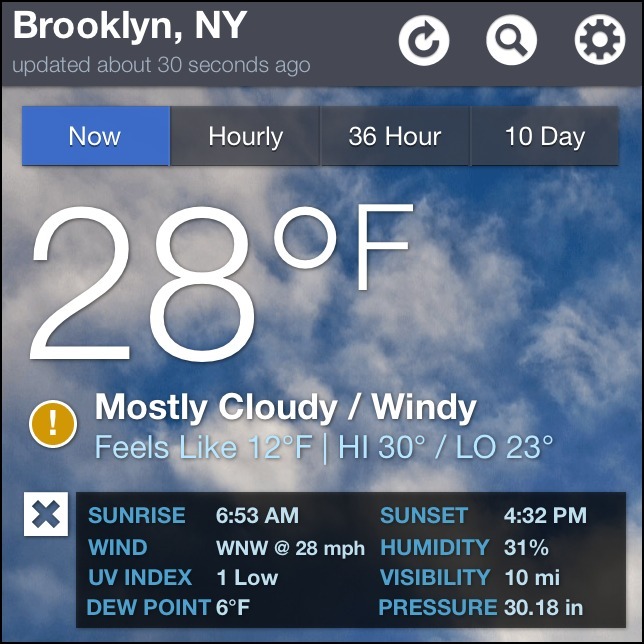 Yeah, I can’t believe how cold & windy it was all across the country, it was incredible! Haha, yeah it was a fun theme, they even put on FB that it was “brisk” out and called the medals “Chanukkah Gelt”. Definitely a Chanukkah miracle that I finished at all let alone in the time that I did! Hopefully next year it’ll be a tad less arctic. and they have a really nice set-up if you volunteer! I wish more races did that. Wow! If that’s the determination needed to finish the Dopey Challenge, then I’m in serious trouble! Awesome recap, awesome determination, from an awesome runner! I was fortunate to be the last to cross the finish line. By far the hardest run I’ve ever done, and I had an 8 mile leg of RR in Miami at 1 pm. The cold was doable, the wind was not. I’m not ashamed at all. I earned that medal. Others didn’t show or quit ( one girl after the 1st turn around exclaimed “I’m done!”). My husband and I persevered. T would be a great course in April or October! I am so glad to hear you say you aren’t ashamed to be the last person to cross the finish line – anyone who makes it to the finish line of in any race should be proud, but to have made it to the finish of yesterdays race is a true accomplishment for any runner. It was hands down one of the hardest things I have ever done, but I truly believe we are all stronger for it! Congratulations! Thankfully, we were parked (illegally) right at the start/finish. When we got to the car, the floodgates opened for both of us. My husband was worried I was going to scream “uncle!” But with that 2nd loop, we had no choice but to finish. My friend Gigi said it best: “You were just the last winner!” It’s all about perspective. The last 4 miles were the toughest ever. Yes, hands down the hardest 4 miles I have EVER run. Great recap! i enjoyed read this. Thanks Ben! And thanks for stopping by to check it out! 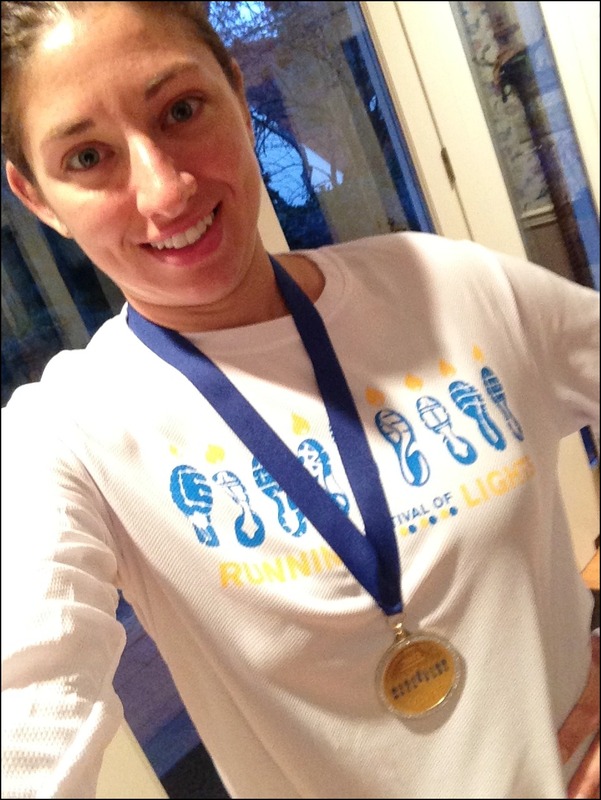 I ran the Chanukkah Gelt 5K earlier that day and it was by far the hardest 5K I’ve ever run (and as a beginner runner, a lot of races have new experiences for me!). I fell on some of the black ice from the waves because I couldn’t see when the wind was in my face. But, I still crossed that finish line and while I was embarrassed at how slow I went yesterday, today I’m kind of proud that I didn’t just turn and run to the train. Congrats on your half! Oh I’m so sorry to hear you fell on the ice, I was so worried about that the whole time! And you have nothing at all to be embarrassed about, honestly anyone who even showed up yesterday deserves MAJOR credit! Congratulations and best of luck with your running! It was my hand you Hi fived at the turnaround. I had a hard time riding my bike back as fast as the back of the back of runners. Thanks so much for being out there! I thought it was rough for us, at least we were running to warm up a little bit! Congratulations! and fantastic recap of the race! I just moved to NYC a couple weeks ago and decided to dip my toes into northeast winter running with this half marathon. Needless to say after completing the race I decided to sign up for some more races this winter, it can’t get any harder than the Running Festival of Wind can it? Haha, well welcome to New York! Lucky you got the worst of it on your first outing – here’s to hoping the rest of the winter isn’t quite as bad! Good luck with your other races! Wow! I’m SUPER impressed with your time, especially considering the conditions! Way to fight through it! Wind is the worst. Cold wind is the double worst. Looks like a nice course, though! Thanks Karla! I have to admit as disappointed as I am that I didn’t PR, I am really happy with my time given the crazy conditions! 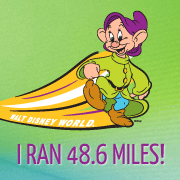 It’s sort of like we talked about though during the W&D meet up, I sort of feel unfulfilled because I KNOW I can PR, I just need a non-Disney, non-crazy weather race! Except for my slower times and being the last finisher you captured the whole race experience so well… Oh and obviously your phone did not die so you got some awesome photos too! I even got out there since I was meeting a friend. Thanks! No matter how fast or slow anyone finished that race it was a HUGE accomplishment! Congrats! I didn’t mean to sound like I thought my slower paces were slow (thats why I don’t really like to post splits or times), but I just wanted to show them so you could see the comparison between with wind and against wind…the difference is incredible and I was putting in A LOT more effort going against the wind! I’m planning on doing it again next year, I liked the route and I feel like I need to tackle it again! I love your recap. You kind of said everything that I would be saying if I decide to write one. 😛 It was my second half marathon yet, so i tried to beat my first time two months ago (Yonkers, 1:48:55). I thought it was gonna be a piece of cake since it’s on a flat course, but I was so wrong. I even asked my friends to register so I’d have company, and they did! I hit the wall around Mile 10-11, I finally decided to take a PowerGel (didn’t take one in Yonkers). I had no idea how “the wall” felt till that day, since I’m new with long distance races. But despite the gel, I still felt too weak to continue, that I decided to walk. And I never walked on a race before. 10 seconds in though, this group of four people caught up with me and yelled at me to keep going. Three of them were taller than me, and next thing I know I was running with two in front, one on my side, one behind. I felt like angels came to the rescue to shield me from the winds. Needless to say I was able to pick up the pace and kept going, till I slowed down again and lost them less than a mile to the finish. In the end I finished 1:50:15, less a minute behind them. But just to finish the race was enough to make me really happy! I looked for all of them and gave them hugs, even though I didn’t know any of them. Just great to be surrounded by fellow runners who support each other. Then also looked for my friends after the race, we all finished and rushed to the car. Then went to the bar, and felt obliged to buy them beer since I asked them to race with me! First of all, congratulations on your second half marathon! Amazing job coming so close to your first time given the conditions we faced, you are definitely going to crush it your next race! And thank you for sharing your story of your encounter with the other runners, I love how supportive runners are of each other, it’s such a wonderful community! Sounds brutal! Top effort and with a smokin’ time to boot! Thanks! It was a tough one, but definitely a learning and character building experience! I did this half too. I respect you so much for not dying out there the way I did. I totally lost it in a way I never had before. I really struggled, but in the end to be honest I think I kept moving just because I wanted it to end! Wow!! Cold and wind make for miserable conditions! You are a rockstar for pushing through and coming in at sub-2!! Great job!! Thanks Emily, I was disappointed at just missing a PR, but to be honest making it through that race was an accomplishment in itself!